Fits all Suzuki RL250 with 520 chain. - Made from 7075 T6 Aircraft grade Aluminum. 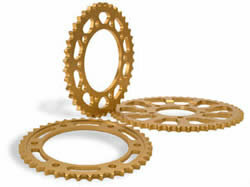 Talon Sprockets are made in England and feature a self-cleaning, heat-treated aluminum design. Talon sprockets are simply the best gearing choice!